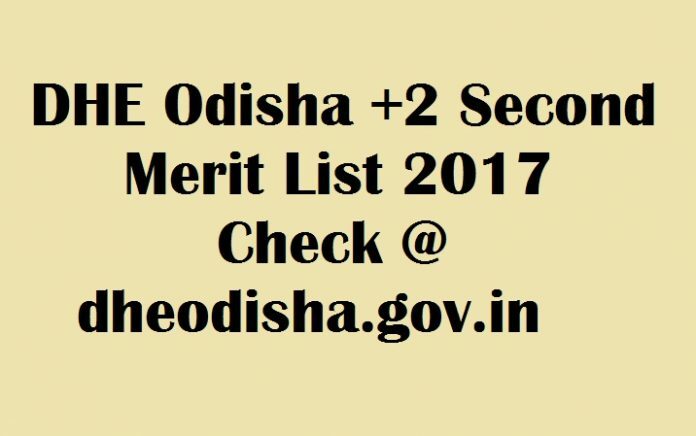 DHE Odisha 2nd Second Merit List 2017: The Department of Higher Education, Odisha has released Second Merit List for Plus 2 Admissions on its official web portal at dheodisha.gov.in. Now, candidates need to check DHE Odisha 2nd Second Merit List 2017. Department of School & Mass Education, Government of Odisha, has formed Student Academic Management System (SAMS) for merit-based admissions in Junior Colleges. As per the report, authorities have given Odisha +2 Admission Second Merit List. Candidates are supposed to download Second Round Plus Two Merit List of Odisha from the online portal at dheodisha.gov.in. A huge number of candidates had filled their applications, and total 1578 colleges are participating. The Higher Education Department, Odisha is improving the quality of education in the state. The Higher Education Sector in Odisha comprises of Degree & Post Graduation including Higher Secondary and +2 Vocational Educations. There are 30 Junior SAMS Colleges and 28 Degree SAMS Nodal Colleges for the academic year 2017-18. Candidates who had submitted their Common Application Form (CPF) and participated in the admission process of Junior College are allowed to choose 10 choices of Junior Colleges in CAF. Those who are eagerly waiting can check the DHE Odisha 2nd Second Merit List 2017 from the official website at dheodisha.gov.in. Students selected will be issued an intimation letter. Applicants can download the intimation letter from the online portal at dheodisha.gov.in or else it may be sent through SMS or Email or College Notice Board. Aspirants if you have any more doubts, please contact to the Toll-Free Number (155335 or 1800-3456770). The admissions to the applicants will open from 24th June to 28th June 2017. Hence, the Junior College will report the vacancies on June 29, and Odisha Thrid Merit List may publish on July 3 and the classes for Junior Colleges (Pus Two) will start from July 6. So, first of candidates have to check the Orissa Plus 2 Merit List from online at dheodisha.gov.in. Therefore, more details regarding 3rd merit list will update soon.